A board of language experts recently picked ten sentences which they claim best showcase the beauty of the Estonian language. These are they. To me half of them seem like they were just designed to be tonguetwisters or entries in an Alliteration Can Be Fun contest. For what it's worth, here's my translations of them. • "Over the creek to the hill, through the valley to the river." • "The gentle warmth of a beloved mother is felt over several generations." • "Listen, dear village woman – you will hear the spirits who have come to the village." • "The juicy cranberry tasted good on the boggy bank." • "The bucket tipped over." • "The tiny little lamb toddled on even ground." They don't have quite the same ring to them in English, do they. 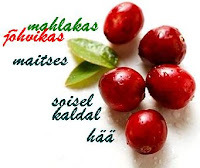 Personally, my favourite is «Üle oja mäele, läbi oru jõele», although «Ämber läks ümber» has an ironic sense of balance to it too. I had to laugh at the results of a Postimees survey published yesterday. It asked the question: "What can we use to attract tourists to Estonia?" The following is a breakdown of the responses. Can you guess which answers made me chuckle? Obviously I agree with every other respondent about how beautiful the country is, and I wouldn't even argue the point about the locals being friendly or things being cheap (although clearly the majority of those who answered don't live in Tallinn). What surprises me most is that almost one in every five people believe that the standard of service in Estonia is good enough to attract tourists. True, things are improving, particularly on the restaurant and cafe scene. But let me share this little vignette with you about a recent trip to the one and only local franchise of T.G.I. Friday's. You can take the part of the waitress if you like. Us: "Excuse me, miss, these fries are cold." Her: [with a smile and a ridiculous hat] "Oh." Us: "Can you take them back and bring us some hot ones?" Her: [still with a smile] "Sorry, no." Us: "Then we won't pay for them." Today is Estonian Flag Day. 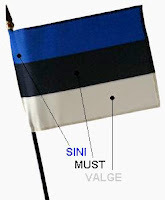 Estonian Flag Day is celebrated every year on June 4 to mark the anniversary of the adoption of the sinimustvalge (the 'blue, black and white' as it is affectionately known) as the national flag by the Estonian Students Society 125 years ago. And here's a picture. For those of you who don't know why the Estonian flag is such an odd combination of colours, Wikipedia explains: "Blue is the colour of loyalty and also represents the sky, sea, and lakes. Black symbolises the past suffering of the people, the soil, and the traditional black peasant's jacket. White represents virtue and the struggle for freedom. It is also the colour of birch bark and snow." I think it is rather lovely. 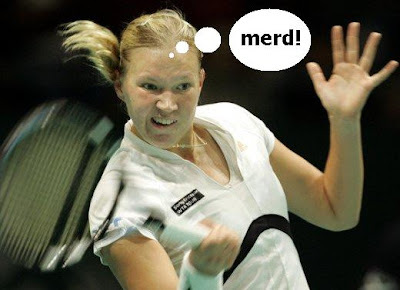 Kaia Kanepi has become the first Estonian ever (I think) to make it to the quarter finals of the French Open, seeing her WTA ranking shoot up from where it used to be, probably somewhere in the three digits, to somewhere close to the top 40. She is set to face Russian world #4 Svetlana Kuznetsova in today's round of play, and if she manages to make it past her to the semi-finals she will have pulled off the biggest coup of her tennis life. Let's just hope she doesn't make a hash of it, otherwise her budding ambitions might go to pot. And other such puns based on the fact that her name means 'cannabis' in Estonian. It is a bit of a Baltic onslaught at Roland Garros this year, incidentally, with not only our Kaia making it to the final eight, but also Ernests Gulbis in the men's draw. But then he's from Latvia, so we don't care about him. 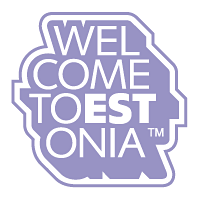 Eurovision over - Estonia having come 41st out of a field of 43 - you will, I'm sure, all be delighted to hear that normal service should resume on this blog 'in the nearest future' as the locals are wont to say. Typically, lots of things have happened in the last couple of months I would have liked to blog about, but alas, time was not on my side. Still, that should all change now. Hurrah! you all cry. Brief update to let all you untold thousands of readers know that there will be a brief pause in proceedings between now (or rather two weeks ago) and the end of May while I focus on my other blog. This is good news for anyone with a particular interest in the 2008 edition of the Eurovision Song Contest. Normal service shall resume in June at the latest. Delfi today has at least eight stories on its front page alone that are clearly April Fool's jokes just from the headlines. They include 'Parliamentarians to give up salaries', which is obviously ludicrous, and 'Anu Saagim to become editor of Postimees', which I only hope is. 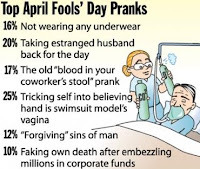 Now I know Delfi's is not the most educated of target audiences, but all the same: what's the point of an April Fool's joke if it's so obvious you can spot it a mile away?